Some ongoing fall projects are re-edging the lawn along the back yard and weeding out the shady triangle area. I last edged the shady triangle in the spring, but it's been a couple of years since I edged along the lawn east of the triangle. Risks of weeding with beggar lice or tick-trefoil. Rewards of wildflowers in the garden. 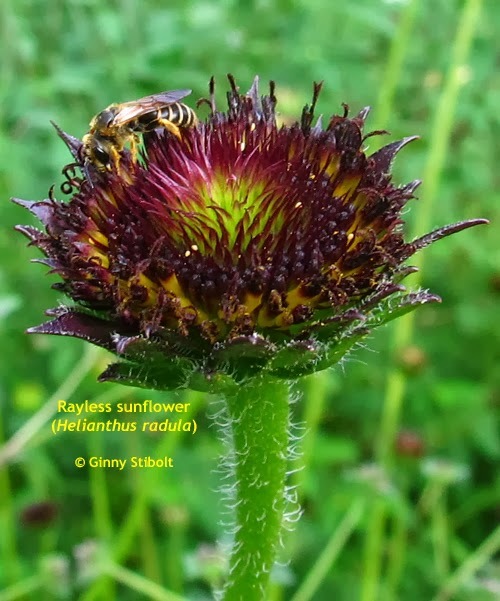 Rayless sunflower & native bee. When I replaced a 10' x 14' section of lawn with a native garden, I planted several rayless sunflowers (Helianthus radula) as part of the mix. 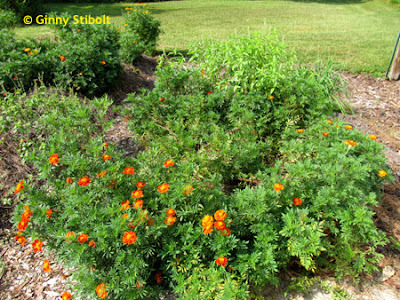 Months later, they are blooming much to the delight of the butterflies and native bees. These flowers are not showy from a distance because they are missing the showy florets around the edge that look like petals. When we think of sunflowers, we expect to enjoy a big show, but the show here is more subtle and draws you in closer. *Just to satisfy my curiosity on this cliché, I looked up the origins of the saying. This particular phrase, "Beauty is in the eye of the Beholder," is a paraphrase of Plato's writings and the theme has been repeated in various ways by different people, including by Shakespeare, over the centuries. See this phrase finder website for more details. 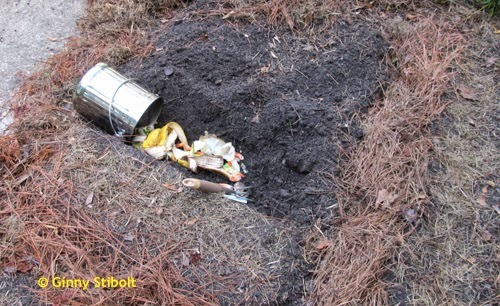 already started composting. They were steaming hot and had turned gray. Normally I do my major compost building later in the fall when we have lots of dead leaves on hand, but several events occurred this year to speed up the process. 1) I'd depleted my compost supply in building the new edible beds and I had saved a pile of sod that we'd removed, which was waiting to be composted. 2) Some of chips we received last week had been on the truck for several days and had already heated up and turned gray with fungal spores. 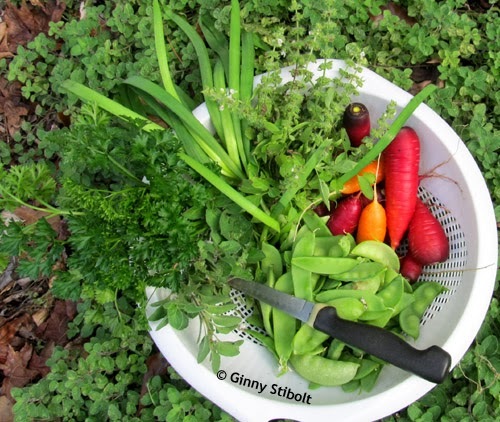 Fall is the beginning of our best growing season--the cool-weather vegetables. 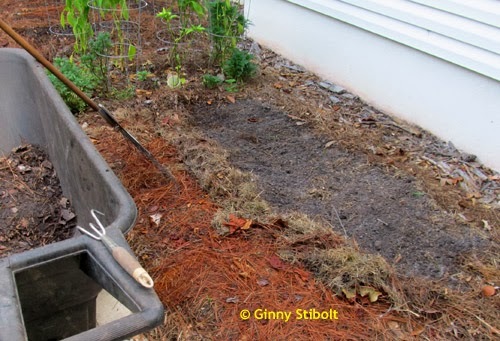 Here in north Florida we normally experience our first frost sometime in late December, but the soil never freezes and we can grow many crops right through the winter. 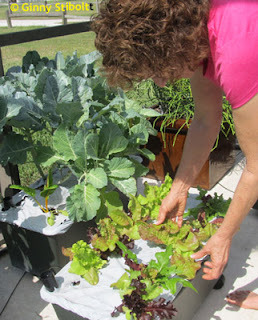 This is why we set up the three planting calendars (for north, central, and south Florida) to begin in September, not January, in "Organic Methods for Vegetable Gardening in Florida." After more than a month of in-the-ground composting, freshly uncovered soil in the middle bed. Kitchen scraps used in the trench between the rows. We have three beds next to the western-facing back of the house: the herb garden next to the porch door, the middle bed, and the north bed. I'd grown marigolds across most of the north and middle beds over the summer and had also grown tomatoes and peppers in the middle bed. When I finally pulled the tomatoes in August, I turn marigolds under in both beds except for the peppers row--they are still producing to some extent. I also had composted kitchen scraps under all of the north bed. 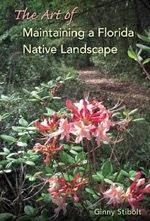 Native plants are NOT invasive. They belong here and work well within the natural ecosystems. 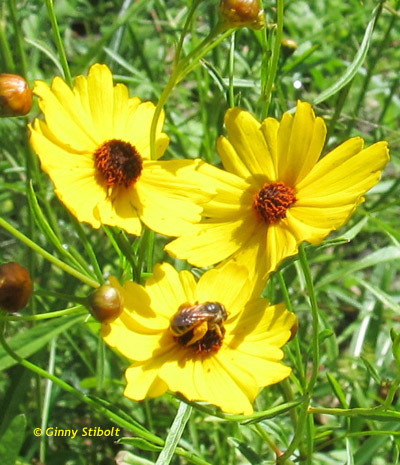 A pioneer plant like beggars' ticks (Bidens alba) is certainly aggressive and efficient at completely covering a disturbed site, but after a couple of years, it will give way to other plants in Mother Nature's succession parade, which depends upon where it's found. 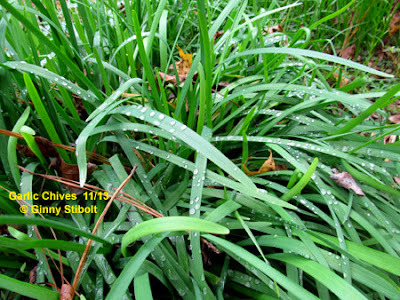 The plants that take over could include broom sedge (Andropogon spp. 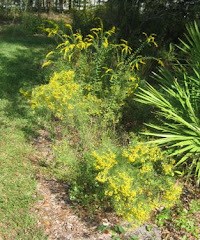 ), goldenrod (Solidago spp. 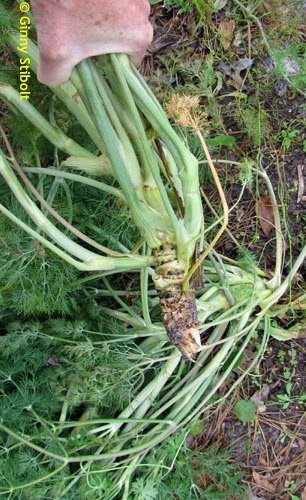 ), dog fennel (Eupatorium capillifolium), which then my be replaced by pines and oaks after a few years. 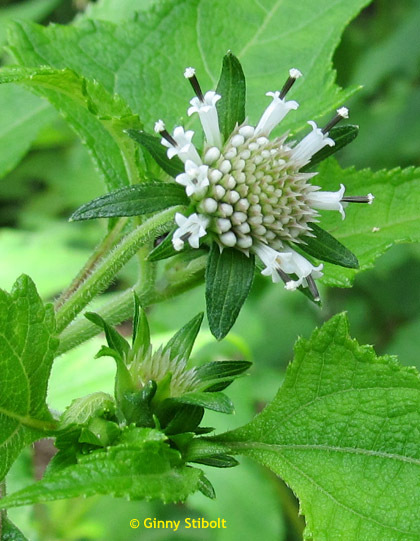 - An invasive exotic plant is a naturalized exotic plant that is expanding its range into natural areas and disrupting naturally occurring native plant communities. Further lawn reduction, more edible garden space, and zebra longwings! 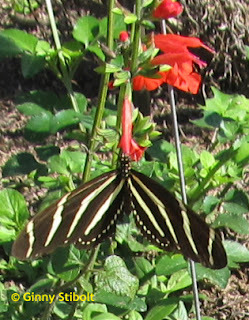 Zebra longwing on tropical sage. 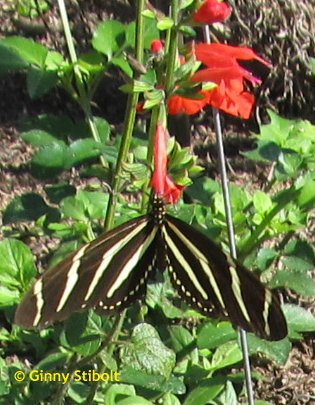 This year we’ve had a huge jump in population of Zebra longwing butterflies (Heliconius charithonia). Our property is aflutter with all their striped glory. They don’t have deep wing beats like a lot of floppy butterflies–their wings hardly move as they fly. They are skittish compared to some other butterflies, but they are mesmerizing. This is Florida’s state butterfly and deservedly so, there are more sitings in this state than others. The larval food is the passion vine (Pasiflora spp), but they like it best when it’s grown in the shade. I’ve been trying for years to create a welcoming habitat for the zebra longwings, so finally we’ve reached the point where this could happen and now we’re teeming with zebras. 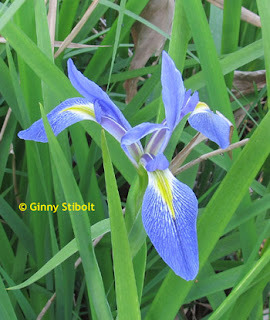 Continue reading my post over on Native Plants and Wildlife Gardens blog, Teeming with Zebras. Ferns create a soft edge between the woods and the lawn. I've always loved ferns in the landscape. It's just so relaxing not to have to worry about whether there will be nice flowers and that their color coordinates with others. With ferns, there are never any flowers, so I can just enjoy their fernyness in the landscape. 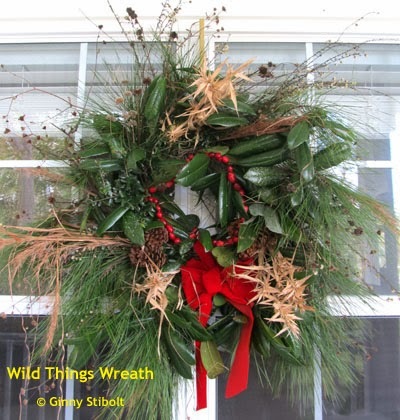 Read my post "Ferns in the Landscape" over on the Beautiful Native Plants blog to see some of my ferns and to learn about their two-stage life cycle. 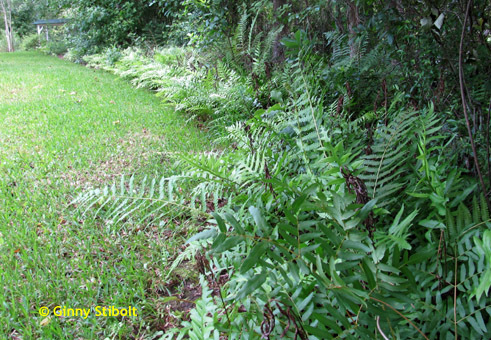 Tuberous swordfern (Nephrolepis cordifolia) is tremendously invasive in Florida. I've removed bushels of them from our property, but many more bushels to go. 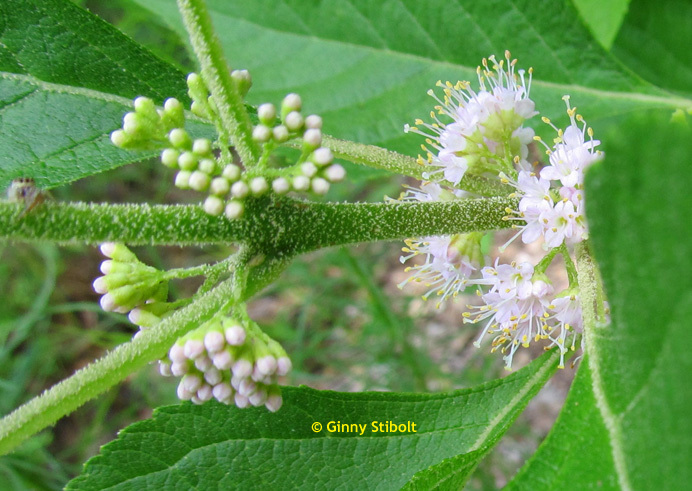 Beautyberry (Callicarpa americana) is blooming now: unbelievably purple berries to follow. 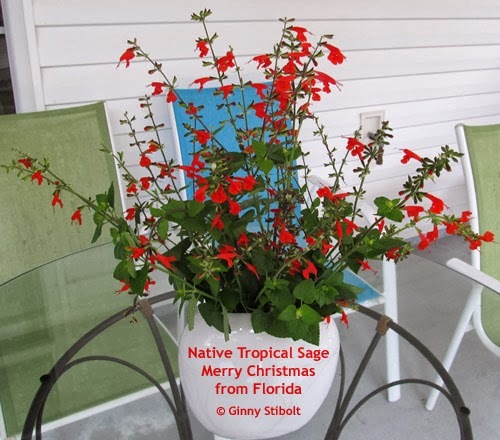 This native shrub is in the mint family and is a favorite of birds in the winter. People make jellies and jams from the berries, but I'd rather feed the birds. Yucca (Yucca aloifolia) bloom in the morning sunlight. This plant is part of our mailbox garden and the spike with the bloom is ten feet tall! 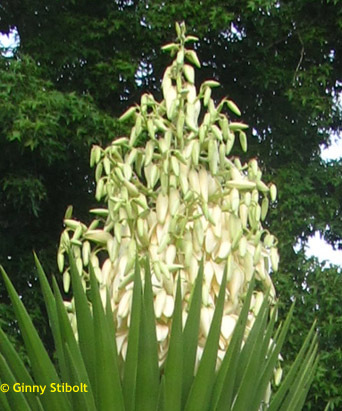 There are a lot of these yuccas in the neighborhood, but they bloomed a month ago including one that is a clone of this plant. Weird. 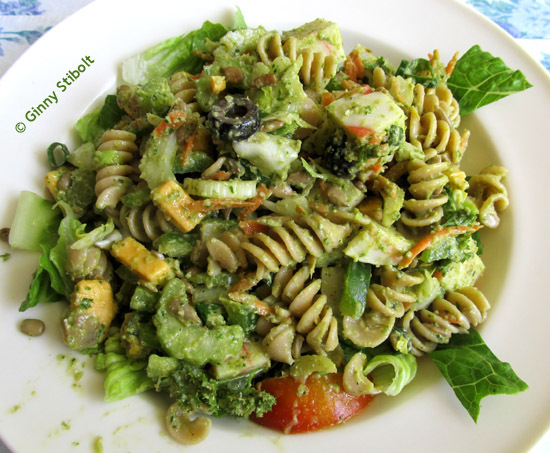 Mediterranean pasta salad. The recipe is flexible and is a great way to use up whatever you have on hand. This rendition included these items from the garden: the last of my cabbage, tomatoes, green onions, sweet onions, cucumber, garlic chives, chives, Greek oregano and curly parsley. The pesto dressing included sweet onions, garlic chives, garlic, Greek oregano, curly parsley, and dollarweed. 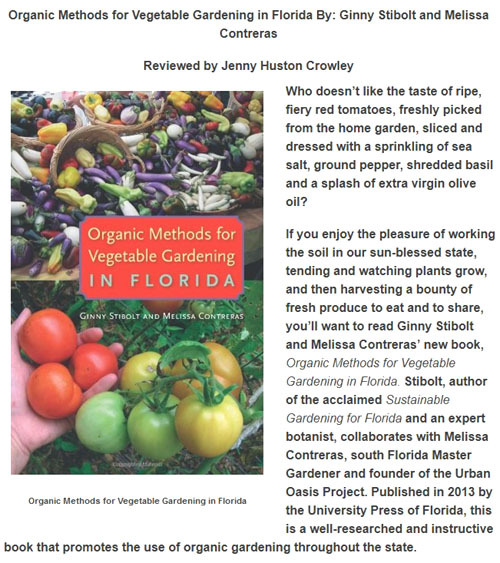 The recipe is on page 171 of "Organic Methods for Vegetable Gardening in Florida." The first snow squarestem (Melanthera nivea) flowers of the season appeared last week. 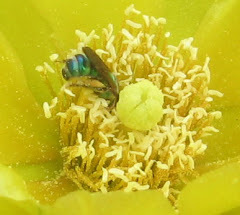 The beautiful pollinator parade has begun! Here's my post on this very-easy-to-grow pollinator plant: Snow Squarestem: a Bee & Butterfly Magnet. 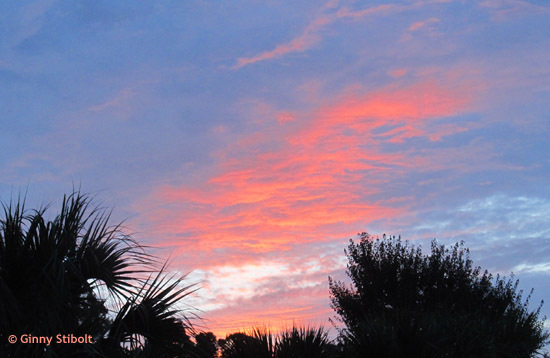 Dawn's early light on July 5th from my front yard. Many of the neighbors went crazy with their personal fireworks the previous evening, even though it was pouring rain. Enjoy the summer in your yard, but garden early in the day to avoid heat stroke! I will be participating in the "Attic Treasures Sale" to be held June 29 8am--11am in Kohler Park on Clark Avenue in Penney Farms. 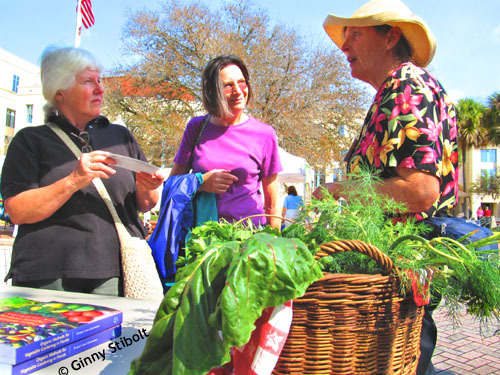 In addition to talking to me about sustainable and organic gardening, you can shop the vendor tables loaded with items, buy fresh fruits, vegetables, locally-made jams, jellies and preserves. Come on down! This will be my last event of my three-month long book tour. Proceeds from this event will benefit the J.C. Penney Memorial Scenic Highway. The 3-mile long J.C. Penney Memorial Scenic Highway will be further enhanced by proceeds from the June 29th event. need to enter Georgia for a while before turning into their road back into Florida. This Saturday afternoon celebration was a change of pace from my other book tour events. 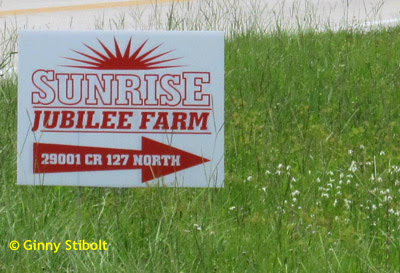 The Sunrise Jubilee Farm, a new organically run operation, held a community-wide pot-luck dinner party. the front meadow. 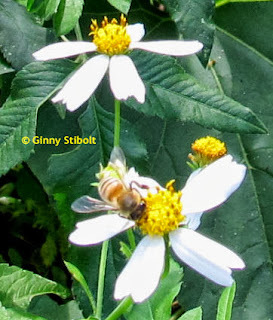 Native bees & butterflies love it! The view from my office has been improved dramatically since I removed a 12 x 14-foot section of lawn and added native plants. "Last September I began this set of garden adventures with the purchase of some Elliot’s love grass (Eragrostis elliottii) at a native plant sale. I knew I was going to reduce the tongue of lawn out into the front meadow and wanted to have the grasses to set the area off. 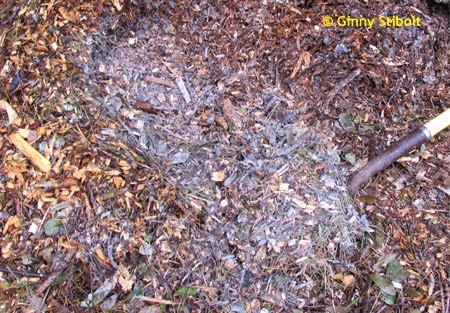 A well-managed edge hides or distracts from a weedy interior. It was recommended that the grasses be placed three feet apart so they’d have room to grow. So I began, yet again, to remove a large chunk of lawn. I started by clearing the space for the grasses and then creating a nice gently curved line for the lawn’s edge so the lawnmower could easily make one single turn to get it all. 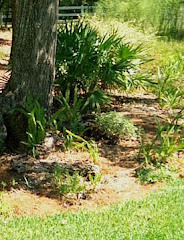 I removed the St. Augustine grass over the next couple of weeks and then I covered the bare areas with a thin covering of pine needles. The holidays came and went before anything else happened." Good-bye broccoli! What a bounty we've enjoyed. From the initial harvesting of the main curds (heads) at the end of November through the endless come-again spears until last week, there have been more than 40 harvests! There's always something going on in the vegetable gardens. 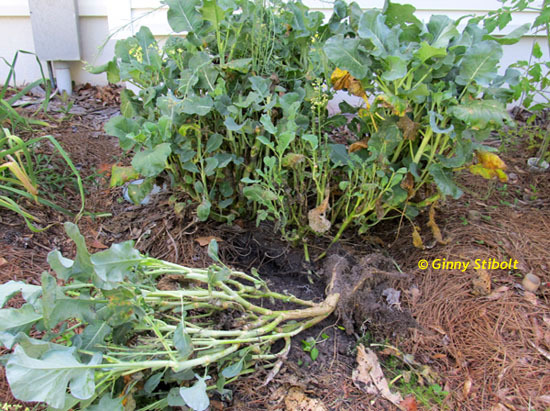 I finally removed the old broccoli plants that had been keeping us supplied with all the broccoli we wanted for six months. 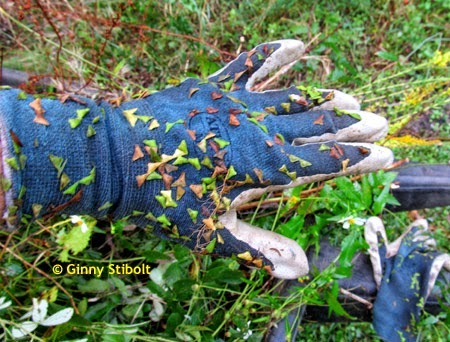 When I removed these gnarly plants, I noticed that two of them had produced a bunch of sprouts from the roots. I have separated out the sprouts and have planted them in a large pot, which I placed in the shade. Will they last through the long, hot summer? 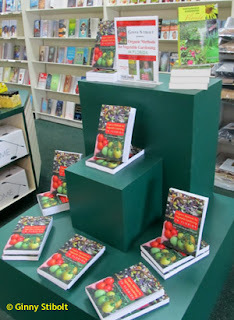 about my vegetables and my books. A fun event. June is upon us and that means that this whirlwind book tour is almost over, and of the six or seven dates left, only two are public. 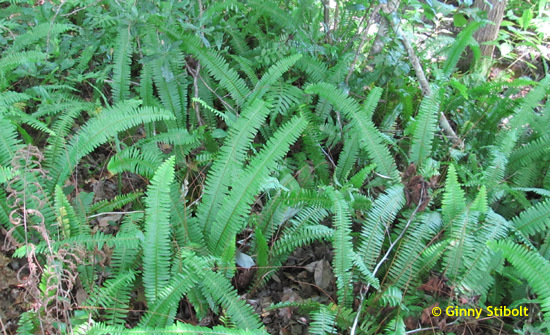 1) June 10th I'll be speaking to the Cuplet Fern Chapter of the Florida Native Plant Society in Sanford, FL at 7pm at 200 Fairmont Ave. 32773. My presentation is Ecosystem Gardening and it's open to the public. I will, of course, also be signing books afterwards. An afternoon celebration on the farm at 4:30pm in Baker County. Jennifer Asbury writes, "This is an open house for the Farm. 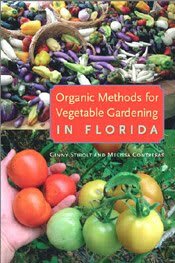 We were invited to be a part of Ginny Stibolt's book Tour featuring her new book 'Organic Methods for Vegetable Gardening in Florida.' We will also have face painting, hoping for a hayride, looking for some local artisans to join us, a community potluck..(so please bring an amazing dish you can share)." There will also be music. Let Jennifer know if you wish to come to the celebration. Here is the farm's Facebook page where you can send a message so she can send you driving instructions. If wish to attend and you're not on Facebook let me know. While I've loved the various gardenfests, most of my speaking engagements have been at Florida Native Plant Society chapter meetings and Master Gardener meetings. And what great audiences they've been! They've asked great questions and have bought a lot of books. I'm always in interested in these in-depth discussions about organic gardening and how important it is for the health of our state. Plus both of these groups do so much volunteering in their communities and provide great outreach and education, so I'm pleased that I can play a part in supporting their efforts. It's been fun to drive all over Florida this spring. 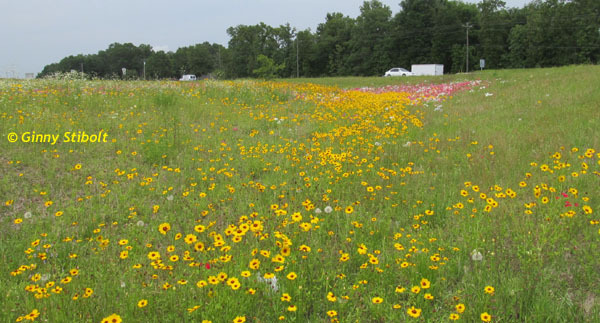 The scenery is often spectacular especially where the "no mow" roadsides have been planted with wonderful wildflowers and where the roads go through undeveloped wooded areas. But, as I found out recently, I didn't need to leave Clay County to find beautiful roadside wildflowers: There is a great display of wildflowers just south of Middleburg. I've also seen some interesting birds including bald eagles, ospreys, roseate spoonbills, crested caracaras, and various egrets and herons. Florida is a fantastic state! 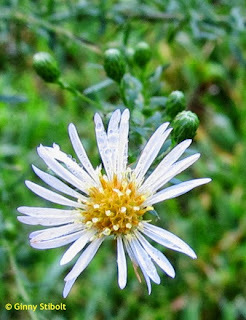 A flowered roadside in Clay County. 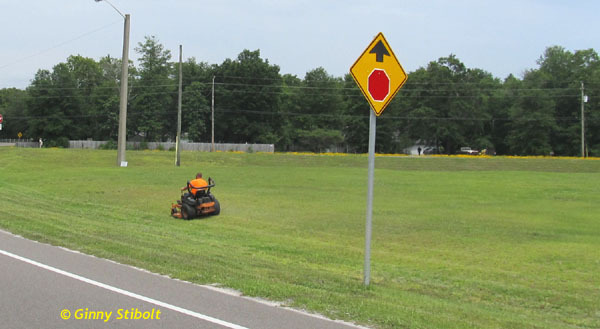 Ironically, this is just across the road from the wonderful wildflowers in Clay County shown above. Which side is more sustainable? wearing another one of my flowered shirts! 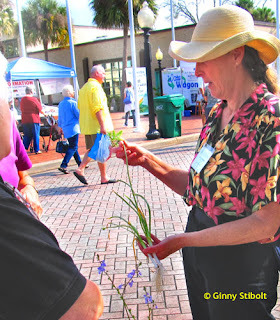 The Florida Native Plant Society Conference came to Jacksonville! I was on the conference committee, the publicity chair, and it was a lot of work to put the conference together. We'd been planning it for more than two years. But in the end it was all worthwhile, because everything came off without a hitch. Yay! To learn about some of the activities and see some of my photos, read my "live Blogging" posts from the conference: Live Blogging from the 2013 FNPS Conference; Live Blogging from the Conference Friday; and Live Blogging from the Conference Saturday. I particularly loved the three-hour nature journaling workshop taught by Elizabeth Smith that I arranged for and then participated myself. We all received an FNPS bag with a sketchpad, pencils, a nice pen, some water colors, a water brush, which I'd never been aware of before. Now the question is whether I will make myself slow down and actually take the time to sketch nature as I see it. I wrote about it in the first post above. 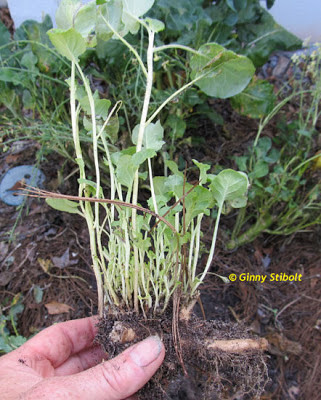 It's my opinion that the best growing season here in north Florida is the winter because the cool-weather crops that grow right through to late spring. But now that season is transitioning to the warm/hot weather and those lovely crops that we've enjoyed through the winter are ending their cycles. I've loved that my husband and I have been eating from the same six broccoli plants since November! After harvesting the large curds (heads) shortly after Halloween, they've sent up side shoots with abandon--if we don't pick them every second day or so, they'll bloom, which would signal that they can slow down. I planted a second crop of broccoli in January that are now sending up their own side blooms, so we've been eating lots broccoli! 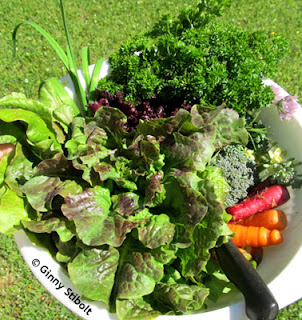 A harvest earlier this week created ... a whole meal salad. In the photos above, I created a whole meal salad from this one harvest. Starting with the knife at the bottom and moving clockwise: butterhead lettuce, garlic chives, purple lettuce, curly parsley, chive flowers, come again broccoli. broccoli flowers, and carrots--both orange and cosmic purple. 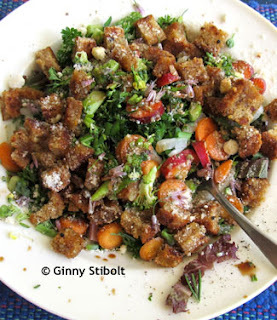 I fried some 7-grain bread in olive oil and wild garlic for croutons and then we created our own oil and vinegar dressing and topped it all off with some Parmesan cheese. Very nice meal. In my presentations, I mention that my husband and I have reduced our food bill by about 15%--whole meal salads are one of our favorites! 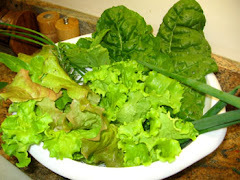 A nice collection of lettuces. 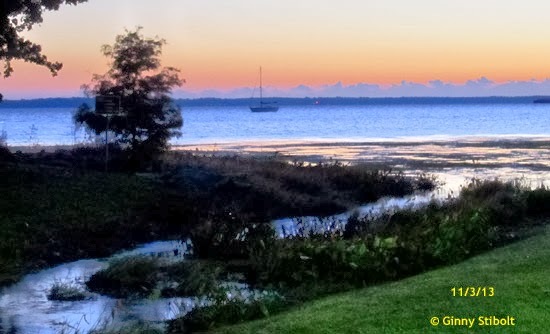 A guest post by Claudia Graves, a college friend and now a new and enthusiastic gardener. My mother could grow anything. It seemed that her touch could bring a sickly plant back from the brink or encourage a healthy one to thrive. “The greenest of green,” is how I used to describe her thumb, but she passed that trait along to my brother only. His plants thrive. Entrance into my house is the kiss of death. Don’t make the mistake of thinking that I kill them with kindness and too much watering. No – I kill them with neglect and abuse. Why use “dirt” other than what lies right outside my door? Why fertilize except for an occasional blast of some chemical so potent that it produces instant wilting… followed by a high probability of death. And watering? Once every few months should do ‘em. So I have “grown” a lot of lush “plastic plants” in my lifetime and not much else. When I talk to groups or attend a garden event, I wear a flowered shirt, so I think of this book tour as the "Flowered Shirt" tour and try to make sure that if I return to an area that no one will see me in the same shirt twice. I have one more talk with a Master Gardeners group tomorrow and then I'll be finished with the first month of my three-month book tour. April has been the busiest month with 17 events including four two-day events! Whew! On Earth Day, I spoke to a nice group at the Vero Beach Book Center. I was pleased that Marjorie Shropshire, the illustrator or "Organic Methods...", was there and I could introduce her to the group. 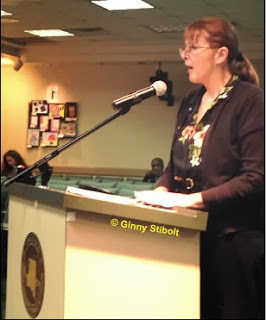 There are still a number of public events yet to come including ones in Pensacola, Tallahassee, Deltona, and my only south Florida appearance in Lake Worth (Palm Beach County). The Lake Worth event will be the only event where both Melissa and I will be making a joint appearance--so come on over. While the "Organic Methods..." book has been hovering in the top ten for Southern Garden Books on Amazon, this is the only time I caught it at the #1 spot. Yay! Thanks to everyone who is buying our book. I'm having a great time talking to people about organic and sustainable gardening on my tour. This weekend, I'll be in St. Augustine and next weekend I'll be in St. Petersburg. It all ends in June. Stibolt and Contreras have constructed a book that appeals to all who wish to grow and produce organic foods in Florida. It is also a book that will interest those who care about our planet and our environment. Read this book and rejoice! Cool! I love it when someone appreciates not only the good information, but also the spirit of our book. Our pinxter azalea finally is blooming. Normally, here in northeast Florida, our springs are too short and summer comes too soon. This year has been different. When the hummingbirds arrived a couple of weeks ago, we thought they might freeze their patooties off in the chilly night temperatures that reached down into the 30s. But they have continued to visit the coral honeysuckle flowers (Lonicera sempervirens) each day, so I guess they are tougher than they look. 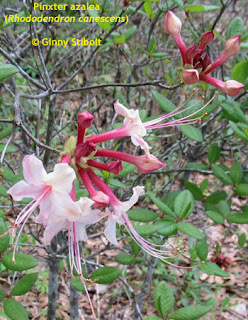 Our native azaleas (Rhododendron canescens) are blooming a little later than normal this year, but the Japanese azaleas bloomed early and their flowers were ruined by the late frosts. I'd like to start replacing the aliens with natives--maybe this is the year to start the process. 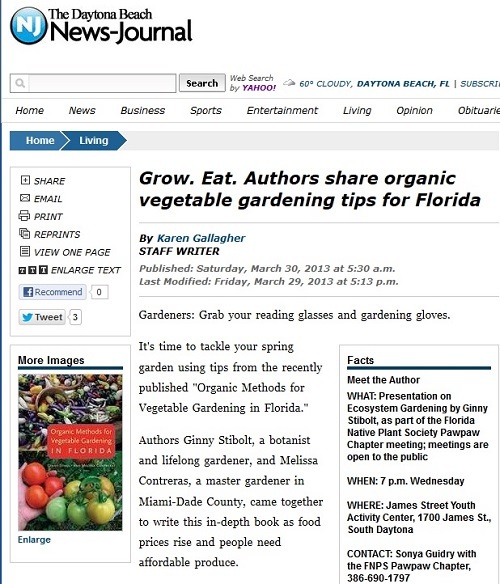 A review of "Organic Methods for Vegetable Gardening in Florida"
This thorough review in The Daytona Beach News Journal by Karen Gallagher is five pages long--Karen said it was 34 column-inches. I think it captures the essence of our book. It includes an interview with me, a notice of my appearance in Daytona this Wednesday, and it includes one of the many recipes in the book--Ugly Carrot Soup. When you grow carrots, some of them may be less than perfect, but they taste terrific when you use them in this unusual soup. I've been using this recipe for years and it's changed with the times. Now it's vegetarian using an olive oil stock made from scratch instead of chicken broth. So now that vegetables are more expensive than ever, why not let us help you get started with "Organic Methods for Vegetable Gardening in Florida"? edible crops and a vase of wildflowers. 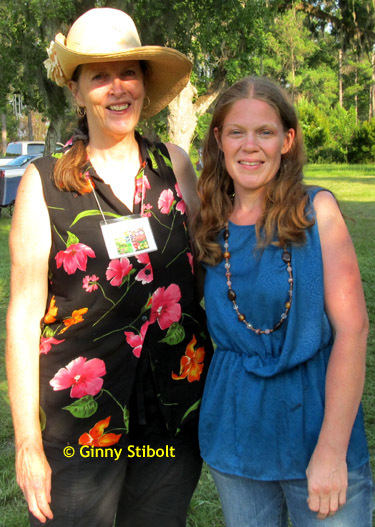 My three-month-long manic book tour consisting of 32 events, including 5 two-days events, started this Saturday with the Annual Wildflower Festival in Deland, FL. 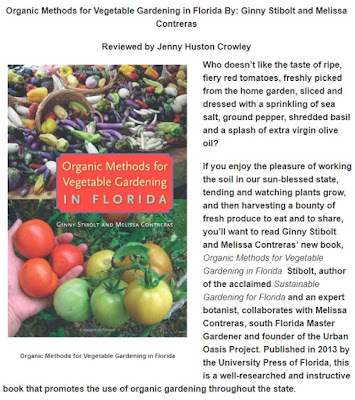 I'm on tour to promote my new book "Organic Methods for Vegetable Gardening in Florida." 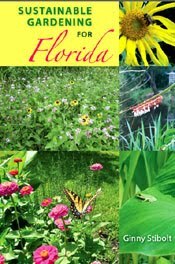 I think people are so ready for this book, that it will outsell my "Sustainable Gardening for Florida" within six months even though the sustainable book has done very well. It's great to have both books to talk about at an event like this because they each cover different aspects of gardening. 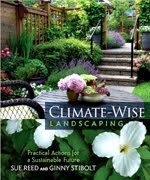 I sold a lot of the vegetable book and a few of the sustainable book to folks who were more interested in getting rid of their lawn or building rain gardens. It rained a little in the morning, which probably dampened the crowd somewhat, but most of the day was sunny and quite pleasant. I love talking to people about gardening and of all the crops I brought, I found myself talking the most about the native wild garlic (Allium canadense). People already know about curly and flat leafed parsley, Swiss chard, rosemary, white radishes, mint, and Greek oregano. As the season progresses, the harvest I bring for show & tell will change, but I'll always bring something to demonstrate that I'm a real gardener with real dirt under my fingernails! If you missed this first event, I hope to see you at one of my other events. See my event calendar to find one near you. Note: the calendar does not include all 32 events because Master Gardener and some other meetings are not open to the public. 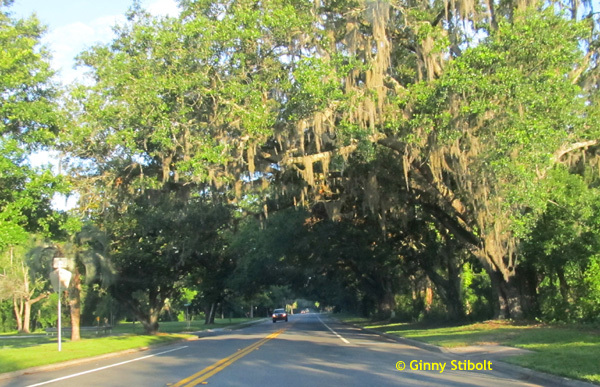 Deland is a beautiful historic town and is also the home to Stetson University. There was an art festival on the other side of town with a free shuttle between the two events. I planted elephant dill for the first time this winter and was originally unhappy that more did not sprout. But then the one plant that did grow became huge--it was three-feet tall and almost as wide. Just one plant served us well through the winter months and until recently into the spring, but it had became too large for the stems and fell over. 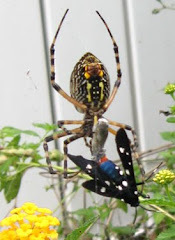 There are a few other smaller plants around that we can use, so my husband and I are fine, but we'd seen some black swallowtail butterflies hovering around in recent weeks. Now those eggs will hatch on a dead plant, so I stuck the two stems in a bucket of water. 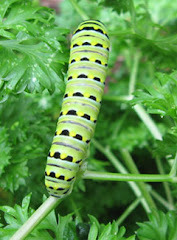 I'll watch for those distinctive caterpillars and when they hatch I will transfer them to the dill & parsley row that I planted for these caterpillars. I dug up the non-native string lilies (Crinum x powellii) that were at the edge of the front meadow and have been replacing them with native bunching grasses, this provides more room for the beautyberry shrub, which has grown a lot in the last couple of years. Also, I wanted to provide a more native mix to edge the meadow. 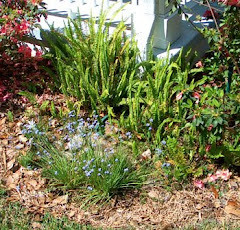 The grasses I'm using are Elliot's love grass (Eragrostis elliottii), a bluish short, bunching grass, and muhly grass (Muhlenbergia capillaris), a taller grass with pinkish flower heads in the fall. I gave some of the string lilies to a neighbor and the rest I planted on the partly shady south side of the house in a bed with some daylilies. I still have some to plant, so I'll probably put the rest of them in the bed next to the screened porch. I took a photo the other day of this native blue flag iris (Iris virginica), which was the only flower in whole mass of leaves on the far side of our front pond. Maybe sometime this summer--after the book tour is over--I'll thin the irises to spread them around and to see if I can induce more blooming. 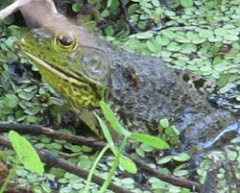 pond out front. Isn't it gorgeous? 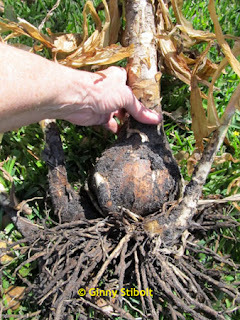 String lily bulbs are enormous. 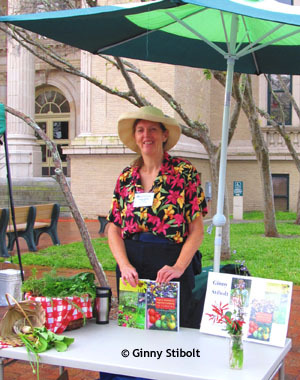 I hope that your spring garden is growing well, and if you're in central or northern Florida, I look forward to meeting you at one of my events! Old gardeners' tales are rampant, even these days. 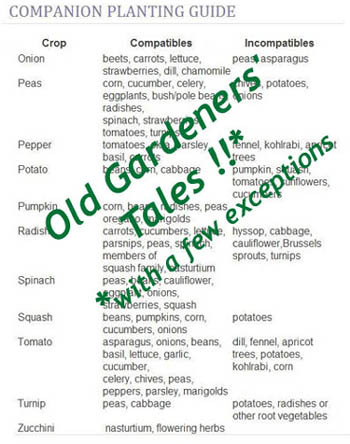 Companion planting advice as shown in this graphic is freely passed along as gospel of the garden. But most of the companion planting pairings (compatible or incompatible) have not been verified with scientific methods. Nevertheless, books have been written about plants with human emotions such as "love" or "hate" used in their titles. Don't fall for these old gardeners' tales. In my research for "Organic Methods for Vegetable Gardening in Florida," I found that the more important thing to keep in mind is the botanical family of the plants so your crop rotation from one season to the next includes different crop families for at least two rounds. This keeps the specific pests guessing and allows the soils to be replenished. 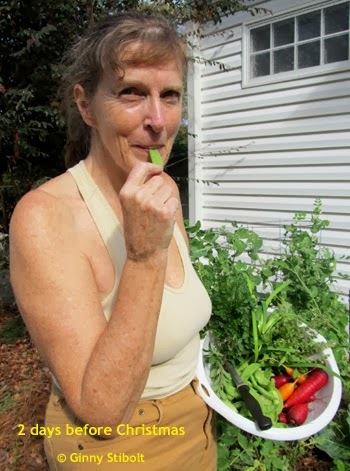 One of my go to resources for garden myths is Linda Chalker-Scott's website, The Informed Gardener. 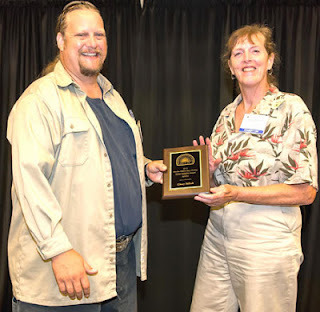 She's an urban extension agent in Washington State and she has access to the professional journals where she researches various gardening traditions to find if the science proves them to be true or not. She's also published two books listing some of the most common myths.